What is Qigong? Why Practice? What benefits does Qigong offer? There are so many ways to answer these questions. I could dive into the rich and vivid history of Qigong that began as far back as 5,000 years ago with the ancient origins of Chinese shamanic Taoism. I could speak of my own healing experiences, how Qigong has been and still is the single most profound form of self therapy for the pituitary brain tumor I was diagnosed with several years back. I could speak of my teacher, Qigong Master Michael Lomax and how Qigong healing has allowed him to recover and function normally through a multitude of different health traumas throughout the years. These would all make for profound and engaging stories, stories that I will choose to save for another time. Instead I will focus this writing piece on my teacher’s teacher, Grandmaster Wang Juemin whose unique story truly highlights the remarkable nature of Qigong and how it can benefit humanity in this current time. My knowledge of Grandmaster Wang Juemin comes from Michael Lomax’s book, “A Light Warrior’s Guide to High Level Energy Healing: Medical Qigong and a Shaman’s Vision”, as well as direct teachings orally told by Michael in person. The story of Teacher Wang Juemin begins at the start of WWII when the Japanese invaded mainland China. Wang Juemin became a soldier in the Chinese army to defend his homeland and fend off the Japanese forces. During a skirmish with the enemy, Wang Juemin took multiple bullet wounds to his legs and went into deep coma. A fellow Chinese platoon rescued him and brought him to urgent medical care. To the surprise of his doctors he awoke and lived. Doctors informed him he would never walk again due to the severe leg damage he had taken. He proved them wrong and began slowly walking, at first only able to move several yards at a time. 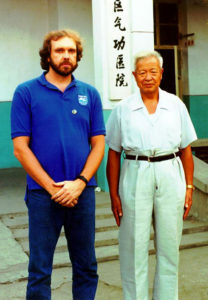 This is when he met General Zhou, his first Qigong teacher. His commanding General, Zhou Qian Quan had spent 13 years training under the abbot of Emei Mountain, one of the four holy Buddhist mountains of China. Learning Qigong for the first time under General Zhou, Wang Juemin’s health and ability to walk improved dramatically. Healed by this first experience of Qigong, Wang Juemin became a changed man and decided to learn as much Qigong as he could, eventually dedicating the rest of his life to the pursuit and study of Qigong. 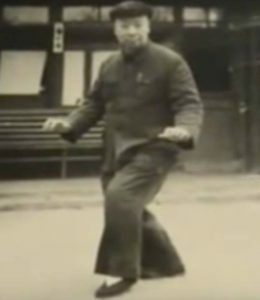 Wang Juemin happened to live in a unique time of Qigong history in China. Qigong has been around for thousands of years, it is rooted in the origins of Chinese medicine. Yet for most of Chinese history, Qigong was an elusive art. Traditionally it was a secretive practice only to be found in temples and healer families who passed these teachings down from teacher to disciple and so forth throughout the ages. The average rice farmer and common folk for example would seek out the local healer when needed but never practiced Qigong themselves. This changed in the 20th century. For the first time, a number of Qigong Masters decided to teach publicly to the masses, realizing that now was the time for these profound healing practices to be shared with the world. According to Master Wang Juemin, there were seven great masters at the time who opened their teachings to the public. Nowadays there are many, hundreds if not thousands of different Qigong forms and styles, many of them derive from these original seven. Wang Juemin learned from five of these original styes, or I should say graduated from five of them reaching the highest levels of Qigong training each of these masters had to offer. These Accomplished Qigong Masters were Jing Wei Qiao, Liu Jui Zhen, Hu Yao Zhen, Chen Yin Ming and General Zhou Qian Quan. In context, completely graduating from a single Qigong Master can take decades or even a life time, Wang Juemin graduated from five of the available seven, an unbelievable achievement to say the least. Of the five Masters whom Wang Juemin studied under, I will highlight one of them, Grandmaster Hu Yao Zhen. Hu Yao Zhen was a widely renowned master of internal martial arts and most notably Qigong healing. His nickname was “Single Finger Shakes the World”, one of the most accomplished men of his generation, he was a master whom other masters bowed to and sought teaching from. One of Master Hu Yao Zhen’s greatest accomplishments was the founding of the very first Qigong Healing hospital in Chinese History. A hospital in which the only modality practiced was Qigong energy healing. In a committee working with the Chinese Government, Hu Yao Zhen actually helped coin the very name Qigong. Qi being energy and gong short for gong-fu meaning skill that requires time and effort. Qigong is the study of energy that takes time and effort. Hu Yao Zhen is deemed the “Father of Modern day Qigong” due to his significant contributions to the field of Chinese energy medicine and important role in helping allow Qigong to become the worldwide practice that it is today. Master Hu Yao Zhen despite his high level and many accomplishments was known for his humbleness, almost always seen with a smile on his face. Authentic Humor and lightheartedness are in fact essential qualities to reaching the highest levels of Qigong inner development. Attitudes shifted unfortunately towards Qigong during the Cultural Revolution of China. A time period where the rise of Communism looked at the old traditions and ways of thinking with distrust. As a way of asserting authority and squashing out any influences which would stand in the way, Chairman of the Communist party Mao Zedong began a purge throughout China. Temples were desecrated, intellectuals, community leaders with opposing views, and spiritual leaders such as Qigong masters became targeted. Master Hu Yao Zhen was a victim of this purge, killed along with many other masters and teachers of Qigong. Master Wang Juemin became a target as well. Master Wang was sentenced to prison for 17 years 4 month and 5 days, while his family sent to work in Chinese labor camps. Master Wang underwent various forms of torture to confess his supposed sins and spent long periods without food or water provided. Upon finally being released from prison and reunited with his family, he stated amazingly that he harbored no ill will or anger towards the Chinese government, none at all. He stated that by being able to continuously remain in the “Qigong state”, he was able to maintain his personal sanity and health. He said, “All of China was insane at that time. We all needed to heal”. This to me is an unbelievable human achievement. To not only remain physically healthy under such harsh conditions for almost two decades, but to come out of that experience holding only love, compassion and understanding for the Chinese people demonstrates what an amazing man Master Wang Juemin was. Being able to continuously remain in the “Qigong state” under such conditions speaks to the level of mastery Wang Juemin had attained. For context for those who have never experienced Qigong, the “Qigong state” is a state of heightened calmness and clarity induced by the practice of Qigong, a state of awareness many practitioners of Qigong know well. Practicing Qigong creates this change of awareness that is both healing and calming to the nervous system’s flow of bio-electric energy, otherwise known as Qi. Even for advanced students of Qigong, maintaining this state of awareness throughout normal life isn’t always easy, for beginners the “Qigong state” of awareness often fades within minutes after a practice. Master Wang was able to strongly maintain this state through his imprisonment for almost two decades, allowing him to maintain good health both physically and emotionally. Master Wang’s account demonstrates the immense healing potentials of Qigong as a way of allowing the body to greatly handle stress. Stress nowadays is being linked to everything from physical pains, digestion problems, insomnia, immune system health, reproductive issues, even cancer. Qigong as a practice allow us to better handle the hardships and traumas of everyday life, which are now being shown to lead to bigger and more progressive issues if left unchecked. Upon being released from prison, Master Wang Juemin moved to the town of Baoding, China and opened up his own Qigong Healing Hospital in the same tradition as his teacher Master Hu Yao Zhen. Using the healing principles of Qigong therapy, Wai Qi Liao Fa (Healing with External Energy), Master Wang Juemin helped treat with great success everything from car wreck victims to stroke recovery patients. It was at this time when my teacher, Qigong Master Michael Lomax, came onto the scene. Michael Lomax was already an adept energy healer of his own right having graduated a 12 apprenticeship with another master of Taoist Medicine, Dr. Vincent Graef, whose own unique story should be saved for another time. Upon meeting Master Wang, there was an instant connection and Michael spent the next several years interning at Master Wang’s hospital. Michael Lomax became Master Wang’s top student and over time shared with Michael all of his treasured teachings of Qigong. Eventually presenting the greatest honor, passing on the title of Lineage holder of Jing Dong Gong, “Stillness Movement Qigong” to Michael Lomax giving him permission to take these teachings and healing methods to the West. The story of Master Wang showcases the amazing potentials that Qigong has to offer. As a self healing practice allowing us to handle and flourish under the most extreme of life situations as well as a powerful system and methodology for helping to heal others. The world that we live in is not perfect, much like China’s Cultural Revolution there still exists much hate, fear, separation, and chaos. Qigong is a powerful tool for promoting calmness, healing, and harmony in ourselves, empowering us to operate from a place of stability and health as we walk through life. Qigong helps in bringing people together through raising our energetic awarenesses, coming to direct experience and realization for ourselves that we are all connected, all human beings regardless of race, gender or identity as well as all other forms of life share the same source of interconnected energy, Qi. Qigong as a practice is always more powerful the more people who practice together, a direct illustration of the healing powers of community. I myself am honored to be a part of the same direct Lineage of Qigong Masters Michael Lomax, Wang Juemin and his many teachers. To me these individuals represent the immense potential that Qigong has to offer in helping heal humanity and raise our awarenesses to that of harmony and love which is so desperately needed now in our current era. Qigong teaches individual empowerment in learning how to heal oneself as well as strength in community by learning how to heal each other. Author: Ben Rosen. Clinical Qigong Practitioner and Gift of the Tao Qigong instructor. Graduate of Michael Lomax’s advanced Clinical Qigong Certification program. Clinical Qigong Practitioner and Level 3 Qigong instructor in the NQA (National Qigong Association). Lives in Portland, OR. More info on his Clinical Qigong healing services and Qigong instruction at www.qiclinicpdx.com. To find Ben teaching at SomaSpace click here. I came out shaking and hardly able to breath, feeling totally exposed, half wanting to run off stage. As the music started and I began to dance something amazing happened. I lost myself. Something new took over, a lightness, a feeling that I was bigger and brighter than I had ever been before. It was truly an out-of-body experience. I was flying, I was totally open, totally free and I felt tremendously powerful. When the moment in the dance came where I took off my top to finally bear it all, it was like no other feeling I have ever experienced in my life. It was like that layer of self-pity, shame, fear, and powerlessness I had carried for all those years, all the insecurities I had felt, suddenly disappeared. I was left with this deep knowing that I was complete and perfect exactly how I am. This is a snap shot into the experience I had the first time I performed burlesque. I attribute a massive point of transformation in my life to dancing burlesque and because of that I feel called to share this experience with other women so that they may have that same opportunity. Teaching burlesque and leading women in this very special work has become such a gift for me and fills me with a deep sense of purpose. There is nothing wrong with me and there is nothing wrong with you. We are all perfect exactly as we are right now. In fact we each have a unique beauty inside and out that no other woman on planet earth can compare to. Yes, we are perfect. This is the truth. 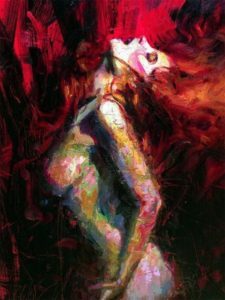 As I continued to dance burlesque, I began to realized that I had wellspring of power and that it was coming from inside of me. I no longer needed the approval of someone else to be ok. I began to truly approve of myself and of other women. I can’t tell you what a relief it was to let that go. It seemed totally impossible before and I feel it is truly a miracle that I no longer live in so much pain. I wont say it was burlesque alone that helped me finally end the toxic lifestyle I was living, but I believe, with every fiber of my being, it was an integral part of a greater awakening. I sought help, went to therapy, I got sober, I read helpful books, practiced mediation and yoga, and surrounded myself with communities who loved me and challenged all the limiting beliefs I had about myself and about the world around me. I did my work and some! The moral of the story is not that every woman should become a burlesque performer, (although, I think any woman can.) The moral of the story is to take action! If you are suffering in any way, take inspired action. Take a risk. Say “yes,” when invited into a new life experience. Live. Your. Life. No one can do it for you. Stripping was part of my path, it may not be yours. I invite you to stay open, to pay attention to what’s being offered, to be a “yes” to life. I urge you to acknowledge what’s not working and to be willing to see new possibilities for yourself, to try new things, to push your limits. Don’t stay in the safety and comfort of your limiting beliefs. Expand. Get bigger. I promise, the freedom you have to gain will be worth every scary moment of uncertainty. I hope to see you on the dance floor soon. For registration about Audrey and her upcoming offerings find them here.